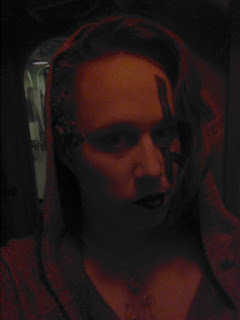 I've never done a Nordic style LARP, so the writing and operation was something of a paradigm shift. We created a setting with a loose scaffolding, a rich base, a range of conclusions, then set the PCs off like a like a bunch of kids with firecrackers. A huge part of the game is helping players develop their own narratives, explore their characters, and become the heroes of their own stories. I'm used to a much denser structure of modules and plot hooks... and an attendant increase in NPC roles and interactions. The players are steering the plot and choosing the end conditions. They say "we want to do something" and we help that occur. The players came in as members of different Source temples, light and dark, to explore a several thousand-year old relic ship that appeared suddenly, belonging to the all but forgotten culture that predates the division of Source users. Things of course devolve into confusion and different agendas and goals as literal and metaphorical ghosts of the past emerge. As a storyteller, I enjoy dark stories, heavy in mood and quandary. For me, the best conflict comes from the players themselves when put in situations that makes them question the core of their characters and goals. That bit above where I mentioned friends saying they hated me or that I was the worst? It was said with a smile. The player tears were from player choice to dive down into a dark place in a scene and see where they could take it. It turns out, Nordic style is incredible for this type of play. My personal highlight (besides being untrustworthy traumatized space ghost AI for a weekend), came from dragging people down to the dark reaches of the ship late the first night and causing emotional upheaval. Late Friday night I ran a "Source Vision" mod, acting as a scene shepherd more than an active participant, deep in the engine room of the ship. 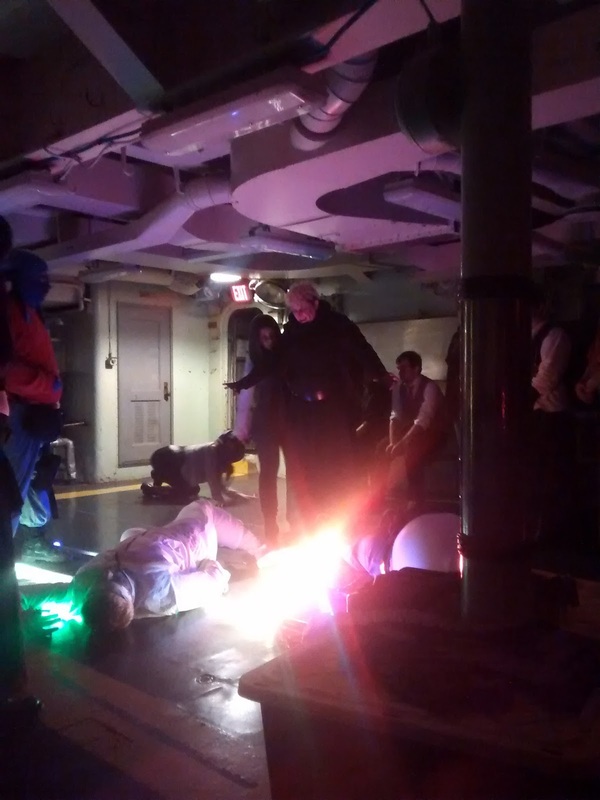 Players were given a choice, "Protect" or "Shelter" and from there either went to a warmly lit corner or deeper into the engine room to a dark nook lit only by swirling black lights to receive their vision/dream. This mod alone made the weekend for me, the two roles were played better than I could have imagined, and the snippets I over heard and the expression on player faces as they exited told stories. I later learned that this area of the ship was identifiable now as "the place of nightmares." I also had the opportunity to wander around and do decision tree tarot readings for characters. I first did in-character tarot at a C'thulhu LARP and it proved an amazing social locus, narrative tool, and all around amazingly enhancing and spooky activity for game. There's nothing like pulling out cards that perfectly represent a character and the dilemmas they face. For this game I picked up the Quantum Tarot deck, to fit with the theme, and told people their stories with it. Everything about doing this was amazing for me, and it worked so well with the personal stories and narratives people were developing. I knew this was something I found fun, but I had forgotten quite how much fun it really was, how much I loved the interactions that come from it. The players all bought into the game, their characters, and exploration. Seeing the plot that they developed and delved into was incredible. I wasn't kidding about tears, players found their character's wounds, and ripped the bandaids right off for all to see. I played a scene where I was part of the FTL engines, frightened and angry at these intruders that were ripping us away from the identity and home we'd known for thousands of years and ended up with tears running down my face when I finally relented. Players would come up to us and say "we want to do [THING]" and we'd go "OK, do it," and so much yes. The ending and conclusion was truly entirely on the players. The team that ran this was absolutely amazing, I am still so thrilled to have had the opportunity to contribute in any way. I cannot wait until we start planning for Run 3, scheduled for October 2018. I love your description of the pre event writing. Loose scaffold, rich base, firecrackers. Perfect!